Surely the first feast came from the water. By net or line, hook or gig, the promise of a fresh catch lures us still, and sustains us always. One of my earliest places of play was a big fish house on the west bank of the Pasquotank River in Elizabeth City. The family of my great boyhood friend Bob Daniels owned the Globe Fish Company, which had been a wholesale seafood business for more than four decades by the time Bob and I, still under 10, would walk there after school, and then bound upstairs to explore the big, cool riverside rooms filled with boxes of ready-to-ship fresh fish on ice, and fish scales everywhere. In those days, too, my mother would often send me off in the late afternoon, pedaling my maroon Huffy, to pick up supper from the busy little seafood market just three blocks down the riverside from the Globe, Mr. Thomas Crank’s place on Tiber Creek. Whenever I walked through the door, from behind the cases of fresh fish Mr. Crank would sing out a popular TV and radio jingle, “What’ll you have?” and then laugh and shout the answer — “Pabst Blue Ribbon!” — before I could even name a fish. How little I knew back then what I was a part of, and a party to, as I ran and biked through this grand, fresh-catch world. How could I have known that the jovial Mr. Crank was carrying on a family tradition reaching back to the turn of the last century? A 1915 commercial directory of my old hometown declared of his and his father’s enterprise: “These gentlemen are unusually careful in the purchase of their products and handle strictly pure, wholesome and fresh fish, oysters, terrapin, etc. in season. All orders promptly filled and delivered, and at most favorable prices.” The same directory reported that in 1915 more than a hundred fishermen worked for the Globe Fish Company, which had a satellite fish house as far away as Cockle Creek’s west side in Ocracoke village. 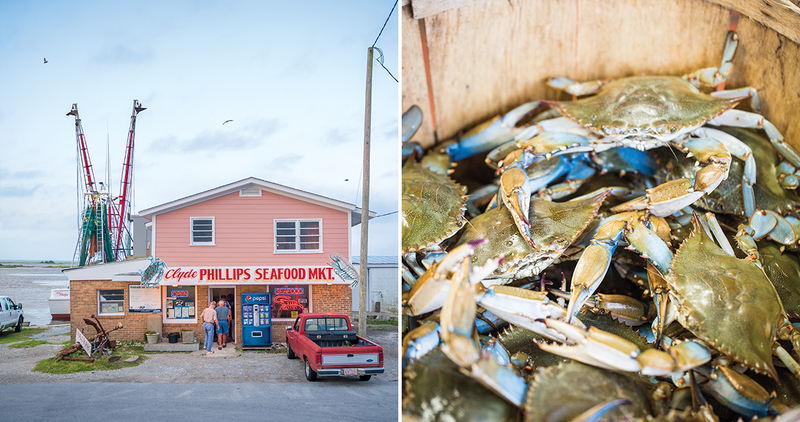 Fish dinners, my parents’ oyster roasts, hard-shell crabs boiling at my grandmother’s Nags Head cottage — these were familial givens. This larger commercial world, though, was a given, too, and we were all in it. The estuarine plenty, pulled together here in Elizabeth City from around the Albemarle and Pamlico and then shipped out, was not just a part of our world — it was the very heart of it. Nor was this anything new. The dauntless young explorer John Lawson happened into the Contentnea Creek valley in the spring of 1701, and there eagerly traded a deer hide to the Tuscarora for two dozen barbecued shad. One hundred and fifteen years earlier, Sir Walter Raleigh’s explorers had marveled at the wealth in the waters and how handily the Native Americans took advantage of it. John White, the future governor of the Lost Colony, painted The Manner of Their Fishing, showing weirs stretched across channels to catch fish, and men spearing and netting from stout dugouts. What we want, and what we get, is the very spirit of the many waters. For many centuries before the English got their first glimpse of all this, Algonkians had camped on the south side of Roanoke Island, at a massive shell-midden at Wanchese called the Thicket Lump. How they did feast, the archaeologists have told us, upon sheepshead, croaker, red drum, black drum, oysters and clams, whelks and cockles. Fresh fish was the first harvest of humankind, before orchards or fowl or cattle or honey, and this was, and is, the food that has fed us since we ourselves first struggled up out of the sea. We go down to the streams and rivers each spring, fishing from banks or bridges, drifting purposefully in johnboats, casting up under willow bushes and knobby roots. My great friend Jake Mills always called it, mantra-like, “old-time river fishing” as we cruised the upper Albemarle shoreline of Big Flatty Creek, chasing the big bream of early May. Whether we found them or they found us, who can say? Yet the primal contract was in effect, and we left many more fish in the creek than we took, and we always took plenty for cornmeal-dusted, iron-skillet fish fries. So, too, up and down the Carolina Coastal Plain, couples go after catfish with cane poles in the lower Lumber. Black River fishermen go out bow-netting for spring shad, dipping for them in the ancient American Indian way. Just 20 miles up the Cape Fear River from where the Black flows into it, an African-American community throws itself into the shad run using 30-yard nets to supply the annual East Arcadia Blue Monday Shad Fry, held here for decades on the day after Easter. Early one summer evening, across Albemarle Sound south of Big Flatty Creek, Jake and my son, Hunter, and I stood and fished till dusk at the end of a long Fort Landing dock, alongside which lay master crabber Willy Phillips’s many soft-shell shedding trays. For the last hour, as the darkness deepened, we were really pulling them in, bream and perch mainly, the fresh catch that would become tomorrow’s fish-and-grits breakfast. Certainly we’d have eaten them that very night, but for the fact that Willy’s wife already had a huge pile of soft-shells underway for a creekside feast. What are we after, after all? Something that slept in the river, or the sound, last night? Yes, to be sure, yet more than that, too. For there is something elemental, perhaps even sacramental, in the food that has fed us longer than all others: fish so tender and fresh that even modest heat would cook it quickly, whether lightly battered and fried, or just pushed around a pan in butter, or smoked slowly over even lower fire. It takes but little heat to make most fish flake off the bone, or to make clams and oysters open most generously for us. What we want, and what we get, is the very spirit of the many waters themselves. It comes to most of us by way of the fish houses and fish dealers, as it long has. In these haunts, the good smell of the rivers, sounds, and sea is in the air, and the prize itself lies upon ice before us, awaiting choice, cleaning, and then the inevitable newspaper wrapping, which we will soon unfold before family and friends. In full measure, the springtime bream of Big Flatty Creek, and the high-summer catfish out of Alligator River, and the jumping mullet in late summer and fall, all hold this spirit, brought down from narrow headwaters, the crowns of willows and maples crowding and towering overhead as the waters course along, down to where they mix and meld into one of the greatest estuaries on earth. Genesis laid it out for us: “Let the waters bring forth abundantly the moving creature that hath life.” So it began, the living spirit of the waters. If we honor that spirit, it becomes us, and, as we take and eat and steward, in effect we swim with the shellcrackers and the pumpkinseeds, with the rockfish and the red drum, and all the rest — in waters abundant and clean — and we are the better and healthier and wiser for it. That, and nothing less, is the irreducible meaning rolled into this pair of words we Carolinians love: fresh catch. Simpson Bland Simpson is the author of The Coasts of Carolina: Seaside to Sound Country, Into the Sound Country, and The Inner Islands. A longtime member of the Tony Award-winning Red Clay Ramblers, he regularly appears on UNC-TV’s “Our State.” He is Kenan Distinguished professor of English and creative writing at the University of North Carolina at Chapel Hill.